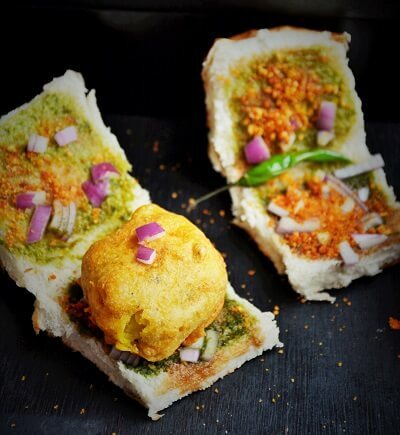 Vada Pav is a famous street food of Mumbai, life of Mumbai. you can say Vada Pav is an affordable food/snack for anybody in Mumbai. As a Mumbaikar Vada Pav is my any time favorite snack, easily available everywhere, anywhere in Mumbai’s galleys or streets. 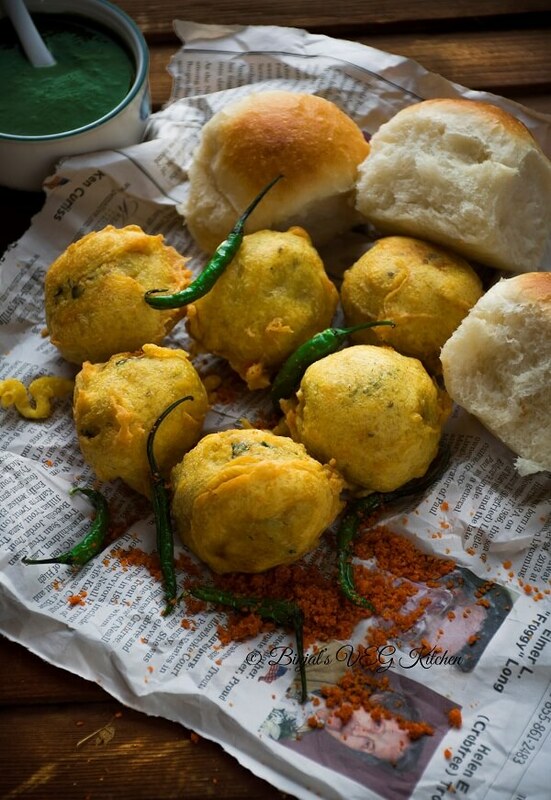 Vada Pav is a very famous street food of Mumbai. It originated as a cheap street food in Mumbai, but it is now offered in stalls and restaurants throughout India. 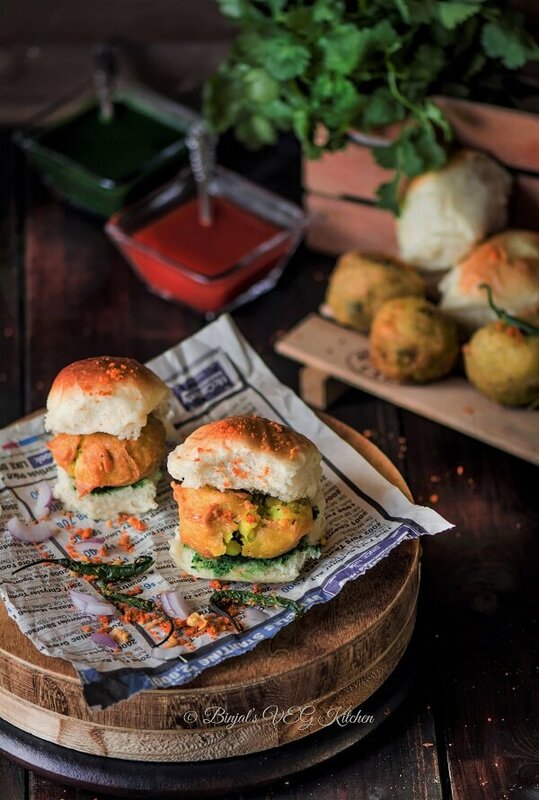 During this period, Vada Pav has become the staple on-the-go diet for Mumbaikars. Stalls and franchises like Goli Vada Pav, Jumbo Vada Pav, have sprung up across various corners of the city. 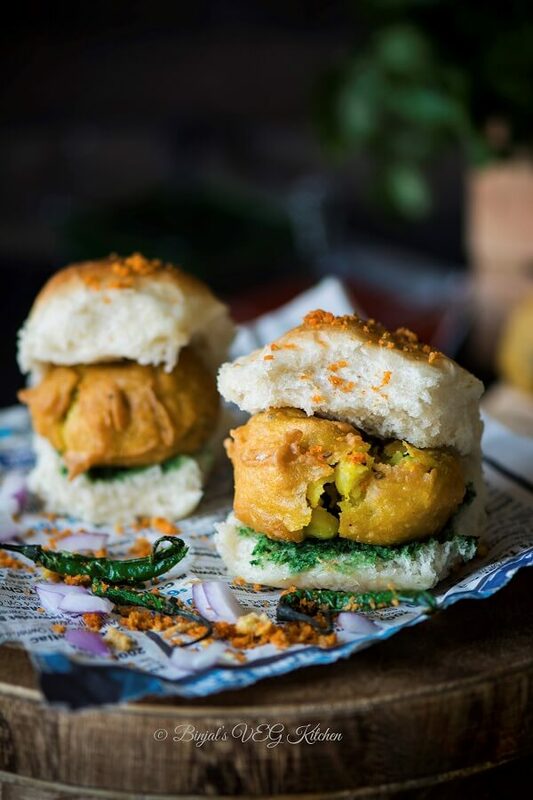 The Vada Pav is an extremely popular vegetarian fast food sold on sidewalks, and in starred restaurants all over the city. 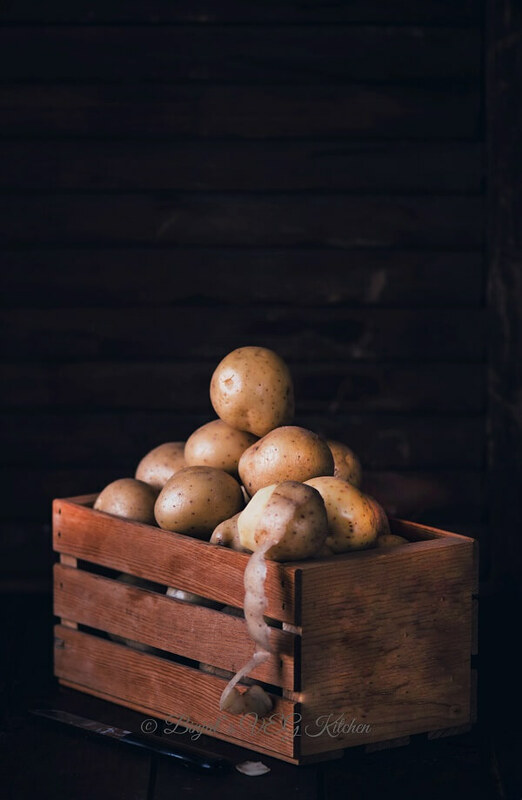 It is cheap, hot, filling and, in comparison to so many other dishes that are classed as ‘fast’, nutritious — starchy, energy-rich and not too greasy. The vada is made of boiled and crushed batata, or potato, which is mixed with spices, herbs, chilies, ginger and garlic, and shaped into a patty, dipped in a coating of gram flour or besan with spices and then deep-fried in very hot oil. This is inserted, piping hot, into a fresh pav, or unsweetened bun. Vada Pav, like Pav Bhaji, was invented in Mumbai. The creation of the dish is credited to Ashok Vaidya, a snack vendor who ran a street stall just outside Dadar station. Being a major commuter hub and an important station, it was seldom uncrowded. 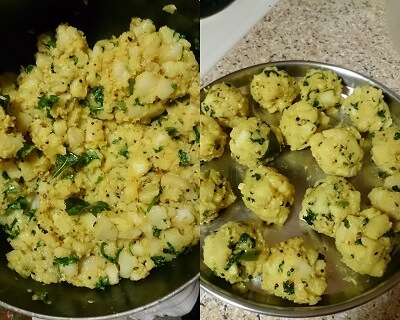 To be innovative and unique, Vaidya reportedly came up with this recipe in 70’s to kill the hunger of the ever-moving commuters who looked like they were in desperate need of a snack that they could eat on the go. In a way, it was like our own version of fast food. He served it up with fiery red chutney with crushed peanuts, fried green chilies and green chutney. 1. Heat oil in a pan. 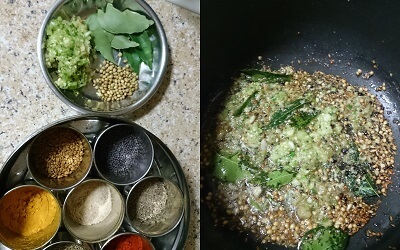 Add mustard seeds, cumin seeds, coriander seeds in it; when its crackle, add the asafoetida, curry leaves, ginger-garlic-green chili paste and sauté for a minute. 2. 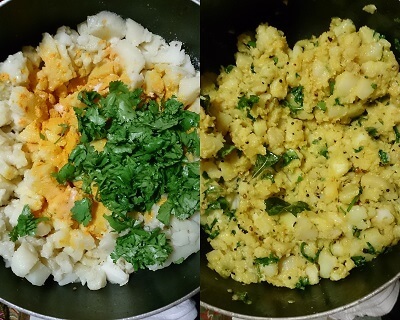 Add mashed potatoes, lemon juice, chopped coriander leaves and sauté again for few seconds. Add turmeric powder, salt and mix it well. 3. Switch of the flame, keep aside and let it be cool for 4-5 minutes. 4. Now take the mixture and divide it into small- small portion and make balls. 1. Take a bowl. 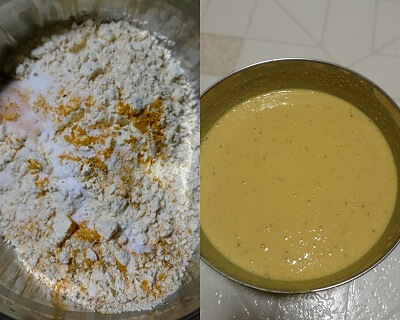 Add besan, salt, turmeric powder, carom seeds, pinch of soda in it and mix well, make a smooth lump free batter, using necessary water. 2. Now heat oil in kadhai/pan for deep frying. 3. 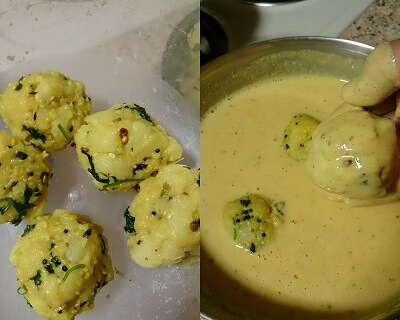 Dip each round of the Vada’s balls into the prepared batter and allow it to coat the mixture well. 4. 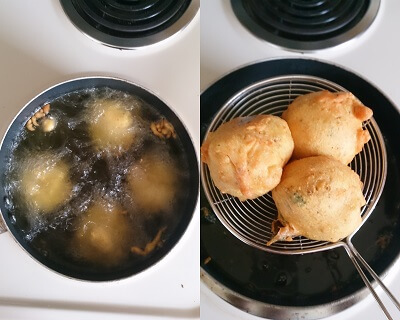 Now drop the batter coated ball into the hot oil carefully, use same process for remaining balls, and then deep fry them into the hot oil, till all sides become golden brown (fry balls into small-small batches). 5. Drain fried Vadas on paper towel and keep aside. Now vadas are ready to serve. 6. Serve Vada with green chutney, garlic chutney and chopped onion as per your taste. 7. You can slice each Pav (bun) into half, spread some green chutney and dry garlic chutney inside. 8. Place one Vada in each Pav and serve it fresh. • You can make your own ginger-green chili-garlic paste using 3-4 green chilies, 3-4 garlics, ½ inch piece of ginger and blend coarsely into the blender. • You can make Vada into the appe pan instead of deep frying. • You can adjust spice level as per your taste. Switch of the flame, keep aside and let it be cool for 4-5 minutes. Now heat oil in kadhai/pan for deep frying. Drain fried Vadas on paper towel and keep aside. Now vadas are ready to serve. Serve Vada with green chutney, garlic chutney and chopped onion as per your taste. You can slice each Pav (bun) into half, spread some green chutney and dry garlic chutney inside. Place one Vada in each Pav and serve it fresh. My wife’s favorite! It looks so delicious! What an inviting click binjal..love vada pav.